The company tempered its outlook due to a slowdown in international shipping and costs associated with business realignment activity in the United States plus ongoing integration expenses in Europe related to the company’s acquisition of TNT Express in 2016. For the period ended Feb. 28, FedEx posted net income of $739 million, or $2.80 per share, compared with $2.07 billion, or $7.59. Adjusted net income was $797 million, or $3.03, compared with $1.02 billion, or $3.72 a share, in the same period a year ago. The company said this year’s results were adjusted to exclude TNT Express integration expenses of 21 cents. That compares with 34 cents a year ago when results were adjusted to exclude TNT expenses and the benefit of an estimated $1.15 billion reduction related to the Tax Cuts and Jobs Act. “Our financial results were below our expectations and we are focused on initiatives to improve our performance,” Fred Smith, chairman and CEO of the Memphis, Tenn.-based parcel, freight and logistics service provider, said March 19. Revenue increased 3% to $17 billion from $16.5 billion. FedEx said it was taking a number of actions to counter the weakness in global trade, including offering buyouts to certain employees and cutting back on hiring. Chief Financial Officer Alan Graf also said the company is limiting discretionary spending and reviewing “additional actions,” which he did not specify, to offset the slowdown in revenue growth and a shift from express shipping to lower-yielding delivery services. FedEx has made several high-level changes in its executive ranks in recent months, most recently naming chief sales officer Don Colleran as head of FedEx Express to replace Raj Subramaniam, who was promoted to president and chief operating officer of FedEx Corp. Colleran was replaced by Jill Brannon, a 30-year veteran of the company who had been senior vice president of international sales. 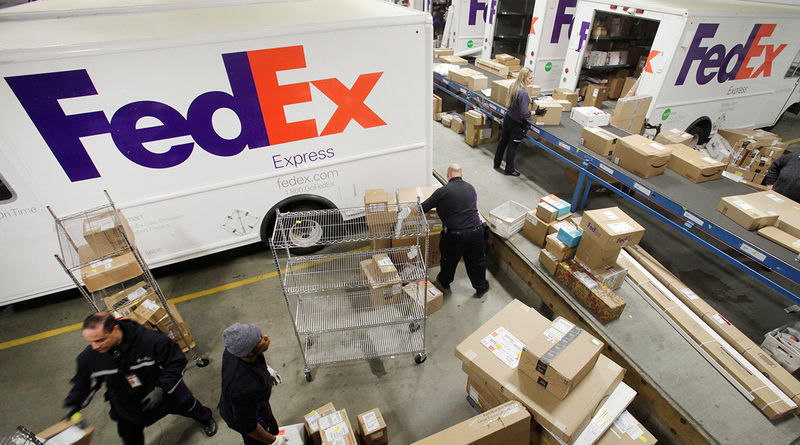 Costs related to business realignment activities in the United States, including employee buyouts, are expected between $450 million and $575 million, with most of the expense occurring in the fiscal fourth quarter, FedEx officials reported. The work of integrating its intra-European package shipping business, which began in February, will continue over the next two years and will cost more than $1.5 billion. Integration expenses in fiscal 2019 are projected to be $435 million, the company said. For the year, FedEx said it projects diluted earnings of between $15.10 and $15.90 a share, down from its previous forecast of between $15.50 and $16.60 a share. By division, FedEx Express generated operating income of $370 million in the fiscal third quarter, up 17% from $317 million in the same period a year ago. Revenue dropped 1% to $9 billion from $9.1 billion. FedEx Ground generated operating income of $577 million, down 6% from $614 million. The lower profits reflected increased costs for purchased transportation and the launch in January of year-round, six-day-per-week operations. Revenue rose 9% to $5.3 billion from $4.8 billion. FedEx Freight generated operating income of $97 million in the most recent quarter, nearly double the $49 million in the prior year. Revenue climbed 8% to $1.75 billion from $1.61 billion. For the first nine months of the fiscal year, FedEx said it earned $2.51 billion, or $9.41 a share, on revenue of $51.89 billion, compared with $3.45 billion, or $12.63 a share, on revenue of $48.14 billion in the same period in fiscal year 2018. In terms of shipping volumes, FedEx said the average daily package count in the fiscal third quarter rose 2% to 6.28 million from 6.15 million in the same period a year ago. However, the average daily volume of packages and envelopes shipped overnight in the United States fell 1% to 1.83 million from 1.86 million, while the average daily deferred shipments surged 19% to 1.22 million from 1 million. FedEx ranks No. 2 on the Transport Topics Top 100 list of largest for-hire carriers in North America.